Visit the official site to view the trailers. HOW'S IT DOING AT THE BOX OFFICE? Site Update July 30 02: The movie makes the cover of this weeks "Newsweek" over in the US. There's some great coverage over on the "Newsweek" website. As well as the article from the print version they also have several video clips of interviews with the cast and more footage from the crop circle documentary that will be featured on the DVD release next year. For those of you in the US there's a "Behind the Scenes" special on the E! network on Thursday, August 1st at 2 pm. It also airs on: Aug 3rd, 11:30 am., 3 am. ; Aug 4th, 7:30 am, 3:30 am. 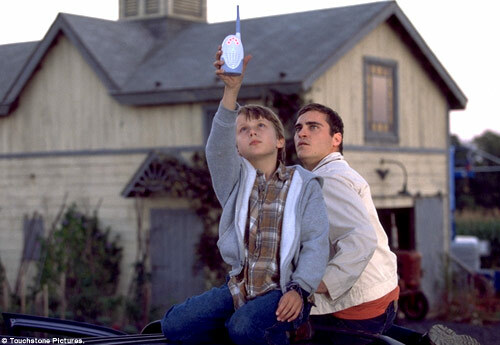 There's also an interview with Signs star Joaquin Phoenix over at the eonline.com website. 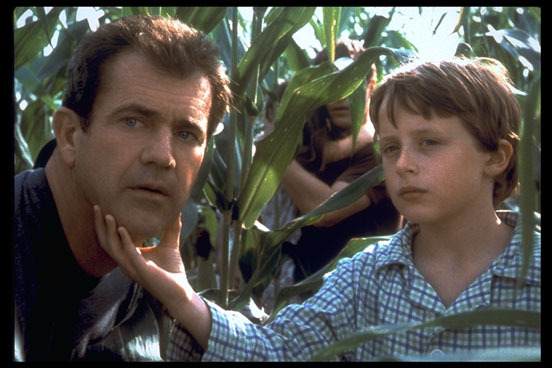 Site Update July 28 02: Before the main shoot commenced in Pennsylvania in September 2001 the crew were shooting in neighboring Fremont, New York on a farm owned by John Meyer for several day. They created a reproduction (pictured right courtesy John Meyer) of one of the most famous crop circles of all time in one of his oat fields, the 1990 Alton Barnes pictogram, which was imortalised on a Led Zeppelin album cover. 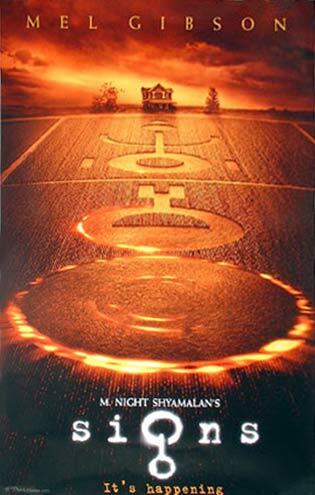 Meyer said that after the crew left he discovered a diagram showing how the crop circle was to appear in the scene that they'd left behind. He's threatened to put it on ebay of the film does well! In the US E! News Live will have live coverage from the world premiere in New York at 6:30pm on Monday 29th July. Site Update July 24 02: The world premiere of the movie will take place in New York on Monday July 29th. Mel Gibson, Joaquin Phoenix, Cherry Jones, Rory Culkin, Abigail Breslin and M. Night Shyamalan will all be attending. The screening will take place at Alice Tully Hall, Lincoln Center Plaza, on the Corner of Broadway and 65th St. The celebs are scheduled to arrive around 6:45 pm and the screening should start at 7:30pm. If you feel like trying to crash the after party it's at The Metropolitan Club, on 5th Avenue and 60th St.
Site Update July 22 02: There's a great article about the box-office outlook for "Signs" over at leesmovieinfo.com, they're predicting that the movie will be a number one box-office smash. They've also collated several pre-release reviews, all of which are unreservedly positive. There are some mp3 remixes of the movie soundtrack over at the official site, featuring Paul Oakenfold, The Crystal Method and Photek. There's a great article about the movie from scr(i)pt magazine, reproduced over at mrjoaquin.com. Site Update July 20 02: chud.com are giving away tickets for several July 29th preview screenings across America. Card codes #11 and #12 have now both been released, see above. There's a glut of 'behind the scenes' shows coming up in America over the next couple of weeks on MTV, Starz! and E! networks. Desperate for her 15 minutes of fame UK crop circle "researcher" Francine Blake has been slagging off the movie to the UK media. Which is a bit rich, seeing as she admits that she hasn't even seen it yet, but maybe she's psychic! Site Update July 14 02: It was bound to happen sooner or later, a crop circle that mimics the formation featured in the advertising campaign for the movie (with the addition of some Mickey Mouse ears!) has cropped up in a wheat field in Wiltshire, England (pictured right). It's in East Field in Alton Barnes, which has been host to many important formations over the years, including the one imortalised on a Led Zeppelin cover. So, is it real, did Disney pay the circlemakers to create it or is it someone's idea of a joke, as is the way with crop circles, you'll probably never know the truth, so just believe whatever you want to believe. Site Update July 13 02: M. Night Shyamalan will be hosting a new special "M. Night Shyamalan's Signs of Fear" on ABC on Monday, July 22nd. The hour-long program consists of ten segments, in which real people describe a terrifying experience that happened to them, and how it affected their lives. Site Update July 09 02: Those promo collectors trading cards are damn hard to get hold of, aren't they! Well, we have all 12 of them here along with other goodies related to the movie such as posters, postcards, stickers etc. Want to get your hands on them, thought you might, enter our "spot the crop circle" competition! Site Update July 01 02: The code for cards #10 that allow you to unlock hidden content on the official site has just been released, it is: X06923, which unlocks a clip from the movie. Site Update June 23 02: The codes for cards #8 and #9 that allow you to unlock hidden content on the official site have now been released, they are: X2201A, which unlocks a mini documentary that features several UK crop circle researchers (Karen Douglas pictured right) and 9R3012 which unlocks a new flash movie. Site Update June 15 02: Toutchstone have sent over a couple of previously unreleased stills from the movie (pictured right) for your delectation, view them  . 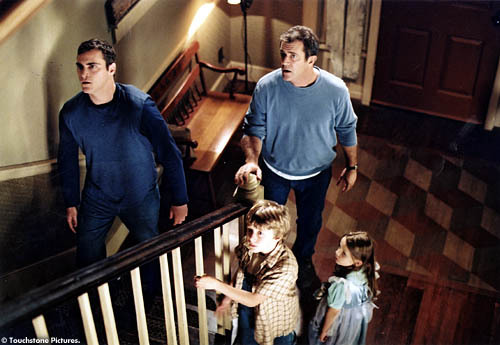 The movie has been rated PG-13 for some frightening moments. Site Update June 4 02: Disney is now running a sweepstakes (until June 30th), where you can win a trip to a crop circle and "investigate" the phenomenon. Site Update May 2 02: The movie had its first public test screening at Marina Del Ray in California this week. Several people who were there have filed reports and the response can best be described as ecstatic! Read the reports:   . Site Update Apr 29 02: The code for Card #7 that allows you to unlock hidden content on the official site has just been released it's: 7Y1411. It unlocks another interview with Mel Gibson. The new full length trailer is now online over at the official site and it's fab! Site Update Apr 27 02: The code for Card #6 that allows you to unlock hidden content on the official site has just been released it's: 6K3415. It unlocks a new movie still, pictured right. The release of the remaining cards #7 through to #12 should run like this: #7 late April, #8 early May, #9 late May, #10 June, #11 early July and #12 late July. 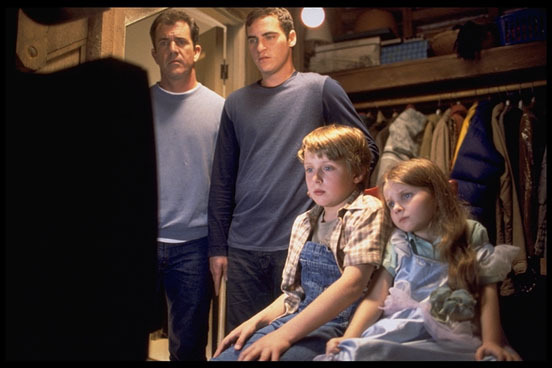 For those in the US, you'll get a chance to see the first full length trailer for the movie this Sunday April 28th on ABC during the network debut screening of Shyamalan's "The Sixth Sense" at 8pm! If you miss it or don't live in the states you'll be able to view the trailer online at the official movie site from Monday 29th April. We'll post #6 through to #12 as we get them. They unlock various exclusive goodies such as interviews with Shyamalan and Gibson and screen shots from the movie... such as this one of Joaquin and Mel looking pensive with the kids! Canada	2 August 2002, Russia	2 August 2002, USA	2 August 2002, New Zealand	15 August 2002, Netherlands	5 September 2002, Germany	12 September 2002, UK	13 September 2002, Argentina	26 September 2002, France	9 October 2002.